The foam cannon is a device that connects to your water pressure washer and outputs a thick foam that quickly shampoos your vehicle. In fact, this method is used by many professional car washers because it is very effective in cleaning a vehicle quickly and easily. The foam cannon not only cleans the paint job in a superior way, but it also prevents you from scratching your paintwork. But one of the best things about the foam cannon is that it is affordable and extremely easy to use. All you need to do is connect it to a water pressure washer, add some shampoo to the container, and you are good to go! Without any further ado, let’s check our foam cannon review below that lists some quality models that are well worth the consideration. 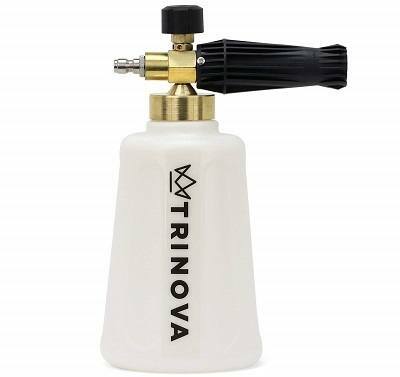 What separates this Trinova foam cannon from the rest of the competition is its ease-of-use and heavy-duty build construction. Indeed, it is built to last a long time because the container is thick, it uses a brass body, and has a stainless-steel nozzle. This is definitely the type of foam cannon that can be used in a heavy-duty situation where you have to perform a love of vehicles in a short period of time. Best, the water pressure required by this foam cannon is very flexible because it will work with a low water pressure of 800 PSI anywhere to 3,200 PSI. It isn’t a very demanding foam cannon in terms of water pressure. The flow rate of 1.4 GPM to 5.3 GPM is also very flexible. Adjusting the flow rate is extremely easy, and all you have to do is twist the knob at the top. 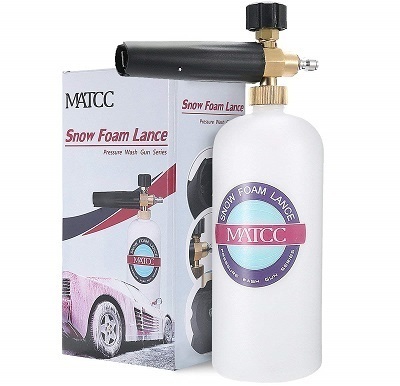 The MATCC is another straightforward foam cannon that does not take much experience to operate. Simply connect this unit to your water pressure washer via the 1/4-inch connector, and you are good to go. It requires 1,000 to 3,000 PSI maximum water pressure to work so any water pressure system should be able to work just fine with this foam cannon. Moreover, it has an okay build construction as it is made from a high-grade plastic as well as has a brass body for even better durability. You are able to adjust the nozzle size on the fly with the adjustment control. All you have to do is twist the handle left or right, and the spray nozzle patterns, as well as the amount of foam it outputs, will change accordingly. It is extremely easy to use and will allow you to foam your vehicle to your liking. Not everybody can afford an expensive form canon. This is where the Fasmov absolutely shines. Indeed, based on price alone, this model is the best foam cannon because it is the most affordable solution you will find in this review. However, a low price does not necessarily mean bad quality. In fact, the build construction is pretty good. It has a brass body as well as a high-grade plastic build construction overall. It comes with a long handle that also allows you to adjust the spray nozzle on the fly. Simply twist the handle, and it will mix the foam accordingly. The only caveat we note with this product is that the maximum pressure of 2,320 PSI is a little low when compared to other models. However, for casual use, it is still more than decent. 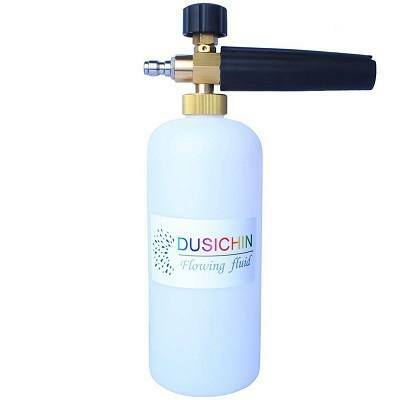 The Dusichin has an excellent build construction and is made specifically for enthusiasts and professional car washers. The container is made from a high-grade plastic so it will not degrade over time. 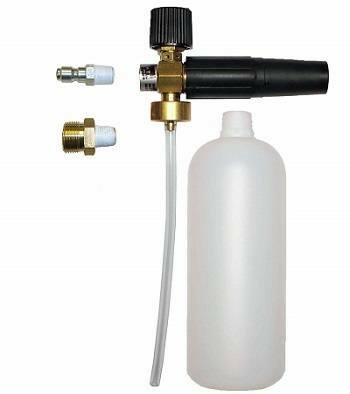 Moreover, you can make various adjustments to the nozzle spray patterns as well as get a very accurate foam mixing with this foam cannon. But what we really like about this model is that the container is graded so you will know exactly the amount of water and shampoo that you add. Of course, this foam cannon will work with universally any type of water pressure washers, as long as it can output 1,000 PSI to 3,000 psi of water pressure. Based on build construction, ease-of-use, and usage, there are few models in this foam cannon review that can claim to be superior to the Dusichin. We highly recommend it if you need a professional foam cannon for professional car washing. If the price is not an issue, then you might as well consider this particular foam cannon. It is quite expensive, but it has a build construction as well as provides you with a level of adjustability that you will not find in other foam cannons here. 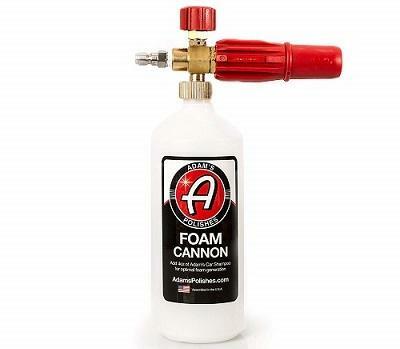 This foam cannon will work with a maximum water pressure of 3,190 PSI which is most than other models can withstand. The minimum water pressure of 870 PSI is also a welcome addition. If you don’t have a powerful water pressure washer, then this model will work just fine. Additionally, it mixes your foam in a very accurate manner so if you need a specific foam density; then it should be able to deliver. 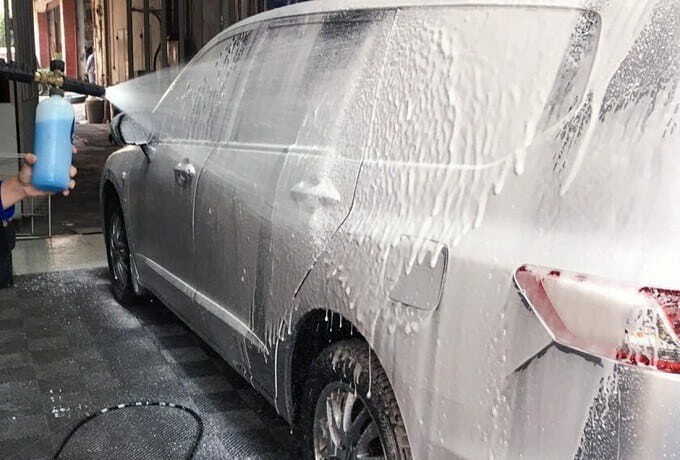 Based on build construction, ease-of-use, and foam pattern, this product is one of the best foam gun car wash on the market. The Blisstime brings a lot of value to the table. 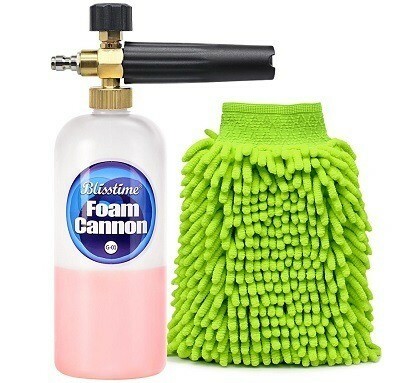 Not only do you get a foam cannon with this purchase, but it also comes with a high-quality microfiber cleaner that will allow you to scrub all the dirt off your vehicle quite easily. 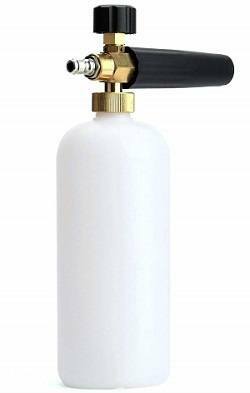 Also, it sports all the features you would find in other quality foam cannons like markings on the container, adjustable foam mix, as well as an excellent brass build construction. When it comes to connecting to your water pressure washer, no problem because this model uses a universal 1/4-inch connector that has a quick release mechanism. Extremely easy to connect! 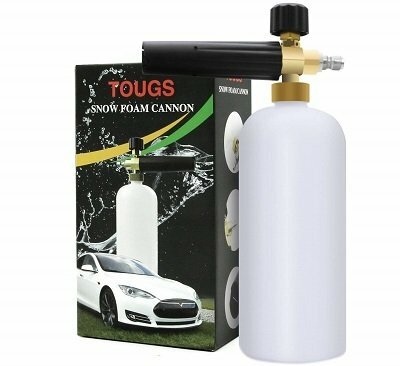 The Tougs Snow is a basic foam cannon. However, it comes at an unbeatable price as well as equipped with functionalities that you normally find in more expensive foam cannons. The container bottle of this foam cannon still has calibration line markings. However, they are not engraved but simply painted over so, over time; they will fade and disappear. Additionally, you can adjust the foam mixing with the adjuster located at the top as well as control the flow rate by simply twisting the handle left and right. Even if this model is certainly not the best foam cannon on the market, we have little to complain because the price is extremely low and it is fully functional. The Bearforce is a reputable and popular foam cannon that is used worldwide by many professional car washers. The reason is quite simple. This model is built like a tank and can withstand heavy-duty usage quite easily. In addition, this unit comes with both a 1.25 mm orifice as well as a 1.1 mm orifice depending on your need. You simply have to screw it in for the installation. Once installed, those different orifices will output unique spray patterns and design. When it comes to the foam, it is quite thick and thicker when compared to less premium foam cannons. 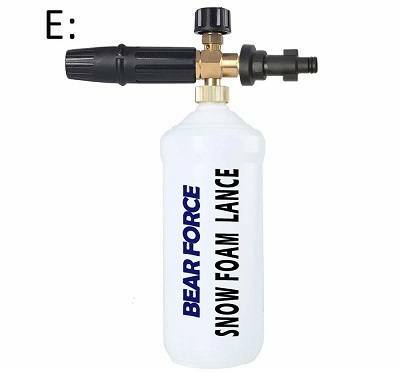 If you need a highly dense foam when shampooing your vehicle, the Bearforce is an excellent model to consider. The only caveat is that it requires a high minimum water pressure of 2000 PSI to work properly. However, for professional use, this is not a problem because most professional water pressure washers deliver water pressure higher than that. The MTM Hydro has a flexible flow rate of 1.8 GPM to 5.3 GPM. This allows it to output an accurate foam density on your vehicle depending on your need. In addition, what separates this top-rated foam cannon from the rest of the competition is its superior ability to adjust the fan blades. It will allow this device to output a jet wide foam that is wider when compared to other models. Moreover, this is one of the few foam cannons in this review that can work with a very high-water pressure of 5,000 PSI. It is definitely suited for professional work when fitted to a professional and powerful electric water pressure washer. If you have a large surface area to foam, then the MTM Hydro is the right choice for you. It is versatile so it can be used anywhere you need to perform detailing work. This foam cannon may not directly fit electric pressure washers by GreenWorks. You may need an adapter for it. 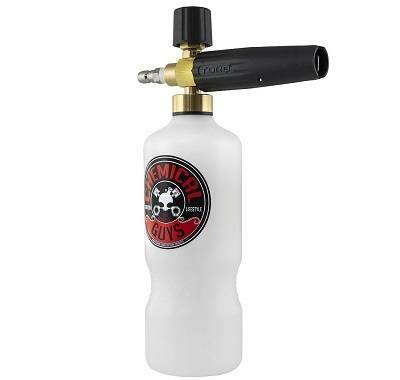 This Chemical Guys foam cannon is equipped with a superior foaming technology that allows it to output a thicker foam. Additionally, you can adjust the thickness of the foam as well as the flow rate quite easily on this model. It comes as only a foam cannon, and you do not get any other accessories with this purchase. Which is a shame, as is it is quite expensive? However, it makes up for it by having an excellent build construction which will last a very long time even when used in a heavy-duty manner. In addition, this foam cannon is able to work with a minimum water pressure of 800 PSI, so you do not need a very powerful water pressure washer. All in all, if you are looking for a reliable foam cannon for heavy-duty foaming that will also last you a long time, then we have no problem recommending this model to you. Both the foam cannon and the foam gun are quite similar in name and the functionality. But what are the main differences between them and which one to buy? Let’s find out! The foam cannon projects a thick layer of foam on your vehicle so as to prevent scratches and marks from happening over your paintwork. When compared to the foam gun, the foam cannon throws a thicker layer of foam. It has a limited spray pattern adjustment mostly because of limitations of the 1.1 mm or 1.25 mm orifice that it is equipped with. Additionally, you will need a water pressure washer to operate the foam cannon because it needs a fair amount of water pressure to work properly. A typical foam cannon will need a water pressure anywhere from 800 PSI to 5,000 PSI depending on the model. On the other hand, the foam gun provides you with greater flexibility in its spray pattern adjustment. It throws a thin layer of foam on your vehicle and it also generally has a smaller compartment capacity. One of the biggest advantages of the foam gun is that you can use it with a regular garden hose. It does not need a lot of water pressure to work. The foam gun is usually intended for smalltime and occasional lathering of your vehicle. For more heavy-duty use, and if you have many vehicles to foam, the foam cannon is a superior choice. First and foremost, you need to ensure that you have sufficient water pressure to operate the foam cannon. Remember, unlike the foam gun, the foam cannon requires a pressure washer specifically because the water pressure washer can deliver adequate water pressure. The pressure necessary will depend on the model you choose. In general, an average foam cannon will require a minimum water pressure of 800 – 1,300 PSI and a maximum of 3,000 – 5,000 PSI. The container of the foam cannon is what holds the water and car shampoo mixture. Therefore, if you will be using your foam cannon for heavy-duty use, then you need a model with a big capacity. For casual use and for a single vehicle, a foam cannon with a capacity of 1 L will be more than enough. The water output or flow rate is how much foam it can output. Most top-rated foam cannons will provide you with the ability to adjust the flow rate on the fly. Additionally, it is common to find a foam cannon that has a water output that ranges from 1.3 GPM anywhere to 5.3 GPM. In order for your foam cannon to work, you will need to connect it by means of a special connector. Most foam cannons are equipped with a standard 1/4" connector so you can connect it to a water pressure washer quickly and easily. In any case, make sure that the manufacturer ships their unit with all installation accessories, which includes connectors as well. You don’t want to replace your foam cannon after every use. After all, you want it to be durable and long-lasting. Therefore, to get a durable foam cannon to choose models that are equipped with a solid brass body and stainless-steel nozzle. Those build construction materials will guarantee that you get a durable and long-lasting foam cannon that will not break easily. In addition to the durability, you must also take into account the chemical resistance of the foam cannon. What this means is how well the foam cannon will withstand different chemicals that you add inside the container. Most car shampoos have chemicals that may affect, degrade, or clog the foam cannon over time. So, by going with a foam cannon that is chemically resistant, you are guaranteed to get a device that is long-lasting and will perform efficiently over time. The nozzle is the part of the foam cannon where the foam leaves the unit. It comes in basically 2 different sizes, an orifice that usually measures 1.1 mm and 1.25 mm. Some models may have 2 orifices of different sizes, while others will have a single orifice size. A smaller orifice size of 1.1 mm will normally output a higher water output than a 1.25 mm orifice. However, it is always best to go with a model that has 2 orifices because it is more versatile and brings more value to the table. Those orifice sizes are usually industry standard sizes that you will find in most foam cannons. Moreover, the sizes can still differ depending on the manufacturer as some manufacturers are known to make orifices smaller than 1.1 mm and larger than 1.25 mm. Lastly, make sure that the manufacturer offers you a way to change between those different orifice sizes in case you go with a model that has 2 orifices. This will allow you to adjust the water output more easily. Using a foam cannon to wash your vehicle will produce a superior cleaning result than simply power washing it with water. It will also prevent you from scratching your paintwork due to excessive scrubbing. Bet, you do not need any special equipment or special experience to use the foam cannon. A simple pressure washer, some water, and a car shampoo will do. Finally, if you have read our foam cannon review above and still not decided on a model yet, then please read the review again.